Royals have been making a splash in the news lately, but there’s one prince who’s stayed out of the spotlight. 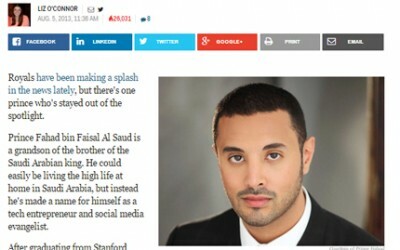 Prince Fahad bin Faisal Al Saud is a grandson of the brother of the Saudi Arabian king. He could easily be living the high life at home in Saudi Arabia, but instead he’s made a name for himself as a tech entrepreneur and social media evangelist. He also sees social media as helping to drive job creation in the Middle East and around the world. “It gave a lot of people opportunities for work, creation, innovation, startups. We have a huge generation of entrepreneurs who wouldn’t have had that opportunity without these social networks,” he said. Appiphany makes slick apps that are like catnip for social media junkies. One of their most popular apps is InstaFeed, a program that allows Instagram users to divide the friends they follow into specific “channels” that can be turned on and off. “At Popover we wanted to create heritage games, games have been played for centuries and generations around the world but that weren’t available to play on Facebook,” said Fahad. “The idea was to help communicate cultures and break down language barriers by letting people play games that are culturally significant for them with other players around the world.” He eventually became a co-founder and saw Popover Games sold to casino games-developer Playsino last year. He’s just turned 30 and he’s a veritable expert on technological growth in the Middle East, but he has a refreshingly funny and youthful attitude. When asked where he would like to see himself in ten years, he said (without a twinge of sarcasm) that he hopes he can have a penthouse on Mars. But he also hopes to see the Middle East back on top: “In 10 years I want to see countries in the Arab world back in their rightful place as a global leaders and contributors,” he said. “There’s an opportunity for me to jump between different industries and I hope to play a part in re-introducing the Middle East to the world in the right way.